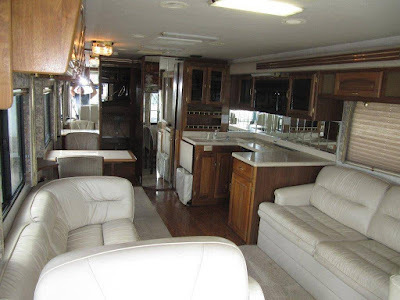 Here's a look at the power plant of our motor coach. 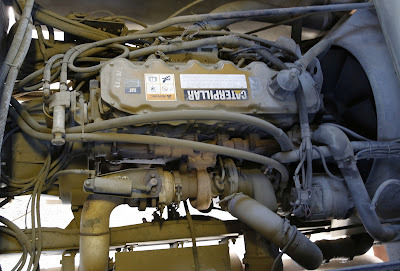 It's a 300 horsepower turbocharged six-cylinder Caterpillar model 3126B 7AS diesel engine. It drives an Allison MD3060 six-speed electronically controlled transmission that features an economy mode. The CAT is an electronically controlled engine with hydraulically activated, electronically controlled injectors. This truck engine produces 860 lb-ft torque that easily pushes the coach up steep grades. 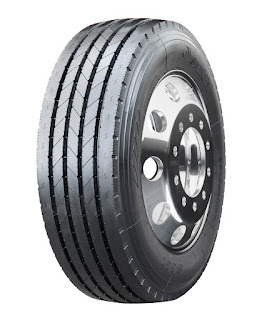 Our coach is also equipped with a Jacobs Extarder system commonly called a "Jake Brake" on 18-wheelers. The Jake Brake improves downhill control and significantly reduces wear on the service air brakes. The M.C. Kismet is big, very big. She is 37-feet long, 8.5-feet wide and stands 12-feet high. She's heavy too with a gross vehicle weight rating of 26,350 lbs. (13 tons) with a cargo carrying capacity of 6,030 lbs. (3 tons). Plus, she can tow another 5,000 lbs. (2.5 tons). Despite the big size and weight, she should average 9.5 miles per gallon (much better than the 6.5 mpg we got in the 36-foot gasoline powered Bounder in July). With her 90-gallon fuel tank the M.C. Kismet has a maximum cruising range of 850 miles (we had less than a 520 mile range in the Bounder). We'll plan on refueling our new coach every 500 to 600 miles. With the planning now complete we have started the countdown for the M.C. Kismet's first voyage. In case you were wondering, that's M.C. 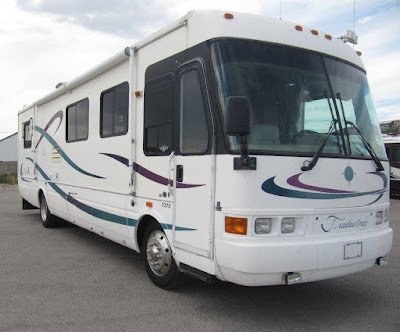 for motor coach, instead of M.V. for motor vessel. Kind of sticking with the nautical theme. 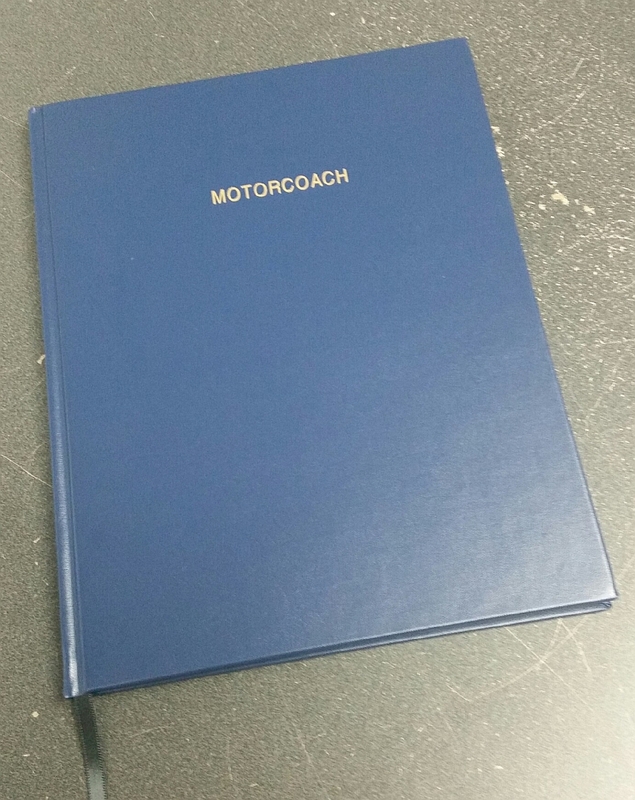 And yes, we even have a real hardbound logbook! This week while we are counting the days, our Tradewinds is getting new belts, fluids, and filters. Bearing are being checked, a new slide cover installed, terminals are being cleaned and tightened, latches and knobs replaced, and the air conditioning and heating controls upgraded. By Friday she'll be ship shape and ready to set sail. At O' dark early Friday Linda and I will leave home for Utah and by mid-morning we'll climb aboard the Kismet. It will be Linda's first time to see her in person. We're both excited. We'll spend about half of the day Friday shopping for provisions. We'll need a little of everything necessary to eat, sleep, and travel for the next five days. A new Keurig coffee maker is a high priority and will remain a fixture for future voyages. It ought to be a good day for Camping World and Wal-Mart. 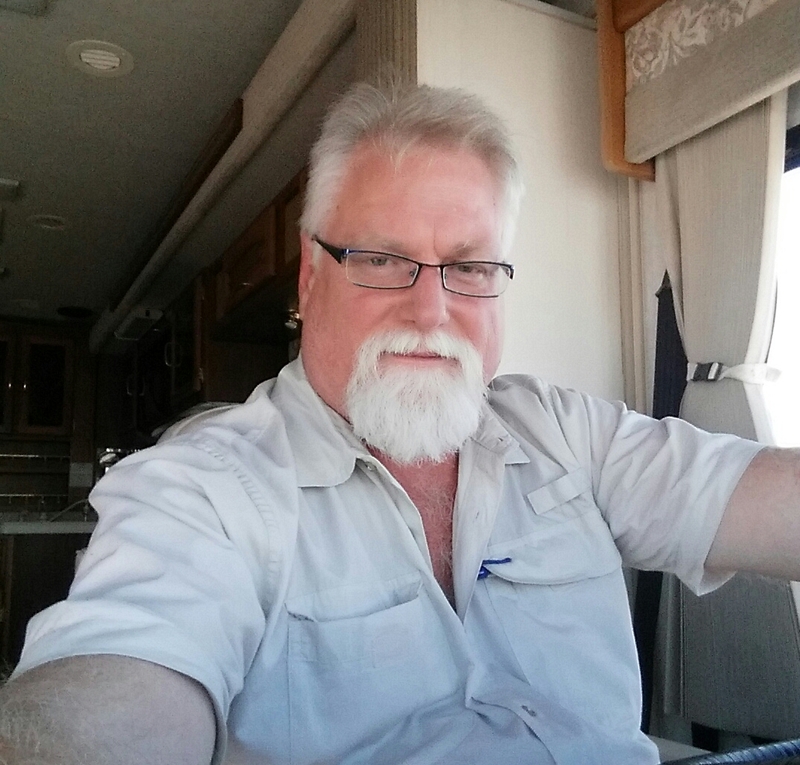 Before leaving Salt Lake City I'll top off the 90 gallon diesel tank and take on 45 gallons of propane. By the end of the day Friday we'll be in Wyoming and the adventure will be well underway. An hour driving, about three or four hours flying, with a change of plane and short layover and I arrived in Salt Lake City. This was the much anticipated inspection visit for what we hoped would be our new to us motor coach. There were a few items that I needed demonstrated or explained. Enter the service manager who was competent and most helpful. Only one item proved not to be functioning 100%, and his response was that they would replace it with an upgrade. Okay. This was all followed by a 30 minute road test. Then another hour rechecking to be sure I didn't miss anything. Most of the day I followed a check list that I prepared in advance, I made notes, and a punch list. Then I had a meeting with the seller and discussed the few additional things that would need to be addressed as his expense. We reached instant agreement. Then I added a list of additional items I wanted at my expense, and who could object to that. And it all needed to be done by October 2nd. Done. So I signed the paperwork and we became the owners of our very own Tradewinds 7372. Before I even left for the airport a crew from the truck tire center arrived and took her away for a set of six very large new tires. On the advice of others we upsized from the stock tires and went with something that was better suited for the weight of this beast. These tires stand 37-inches tall. Wow. Now I'm reversing the morning's travel schedule. This time stopping in Las Vegas instead of Denver, and arriving back in Austin minutes after midnight. So technically I won't even be back at home until Saturday. Now that's a long day. And so it begins. Pride of ownership balanced against the cost of maintenance! We think the secret of motor coach success is use it, and use it often. In less than twelve hours I'll be on my way to the Austin airport to catch an early flight to Salt Lake City. My bag is packed and my papers in order. I'm bringing an assortment of tools and test gear to perform a stem to stern inspection. I expect the result to be a punch list of minor items to be resolved before our return a week later on October 2nd. I fully expect that by the end of the day tomorrow we'll be the proud owners of the "M.C. Kismet." That being the case, I'm taking advantage of the opportunity to bring a suitcase full of items to leave aboard for the trip to Texas. Whatever the news is tomorrow, you'll read it here first. Stay tuned! It's time to start seriously thinking about our maiden voyage and shakedown cruise. 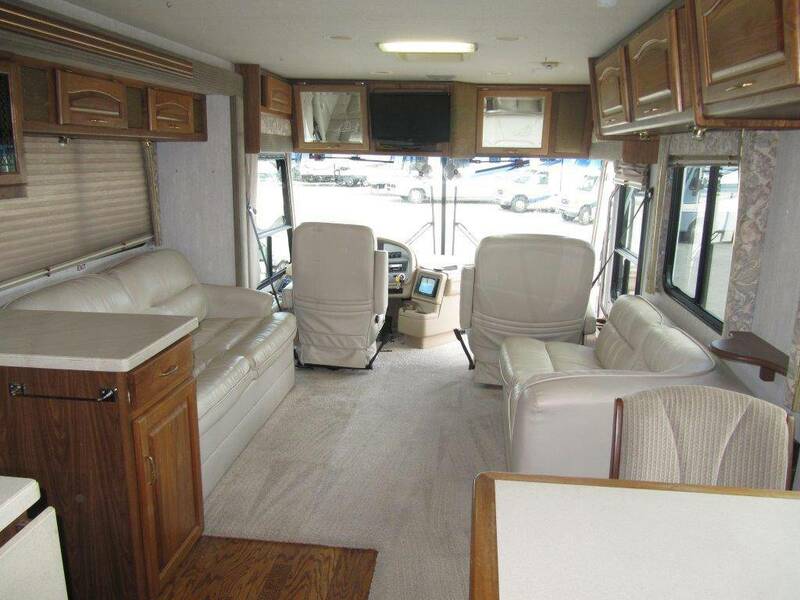 Linda has been in charge of planning the first trip in our new motor coach. Of course we will be starting at Salt Lake City. The first night we'll stay close to Salt Lake City while we stock the coach with food and supplies and confirm that everything is working before striking off across Wyoming. This will be the first time that either of us have been to Wyoming and we're looking forward to it. We'll travel across the width of the state on the Lincoln Highway passing through both Laramie and Cheyenne. Between the two we plan to stop at Sherman Summit (elevation 8,640 feet) the highest point on I-80. We'll be travelling through this part of the country the first week of October, at the very end of their RV season. Some parks will have already closed, and most of the others will close by mid-October. We'll enjoy the cold weather. From Cheyenne we'll turn south into Colorado where we'll spend our second night. Sunday we'll pass through Denver and get a photograph of Mile High Stadium before the Broncos game with Minnesota. Then it's on to New Mexico and Texas. Sunday night we plan on being back in Texas, albeit in the panhandle a little more than half-way home from Salt Lake City. Monday we'll motor southeast across Texas and make one more stop, the fourth and last overnight of our first trip in the Tradewinds. Tuesday afternoon we'll return to the Austin airport so Linda and get our car and follow the coach back to Fayetteville. I hope to get back early enough Tuesday to have the local auto shop perform the Texas motor vehicle inspection required to title and register our new coach. I have to admit I feel a lot like a child waiting for Christmas. I'm counting the days. I also know that the coming week will pass in a flash and I'll wonder where the time went! 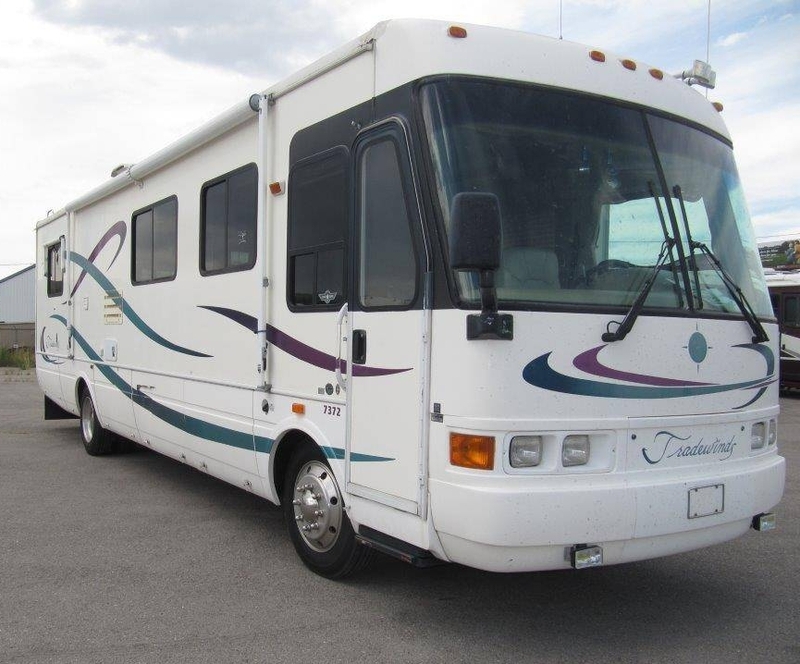 Six days from now I'll fly to Utah to purchase our new motor coach. The flight will be early and I will have worked all week so everything needs to get packed tomorrow before the work week begins. Eek! The weather forecast for Salt Lake City next Friday is warm and dry.That's good since I will want to study every inch of the coach, inside and out, and underneath as well. Dry weather will help with that. A week later when we return on October 2nd to drive home the weather forecast is for more mild days and nice cool nights. 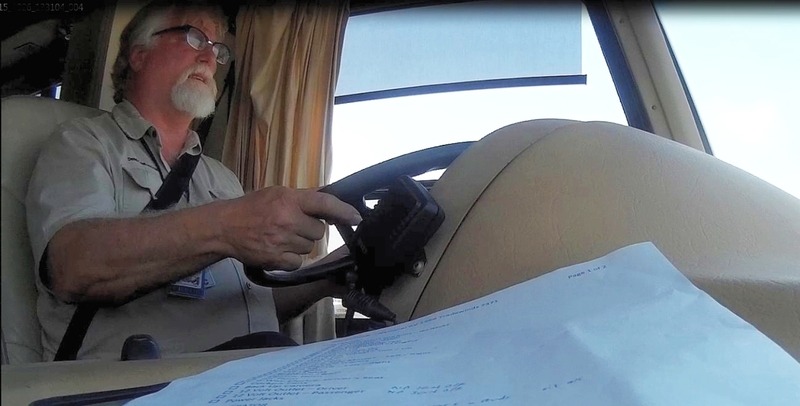 Here I am behind the wheel of a Tradewinds 7371 three weeks ago during a test drive on Interstate 59 in Houston, Texas,. I was having a grand time! It was my first and last time at the helm of a Tradewinds. All-in-all it was a good test drive and I thought it would soon be ours. Alas it was not to be. For a host of reasons we decided it was not the road-ready highway-hotel we were looking to find. So the search continued. In ten days I'll be there again and this time I will be a piloting a top of the line Tradewinds 7372 on Interstate 80 in Salt Lake City, Utah. If all goes well, and I expect that it will, it will be far from the last time I'll drive that Freightliner motor coach. Who Doesn't Love A Good Floor Plan? The floor plan is a huge part of what we love about our coach. Slide-outs are all the rage today, so finding a motor home without too many isn't easy. Specifically I don. 't want any slides in the bedroom so you can get around the bed anytime. And, I want a full Queen size bed, not the shorter RV size mattress. Got to have real nightstands on both sides of the bed. We also aren't fans of any slide on the passenger side where they impact access to basement storage and create head knocking hazards for grandchildren. The kitchen is another big deal. Linda really likes the U-shape counter where she can stand out of the traffic pattern. 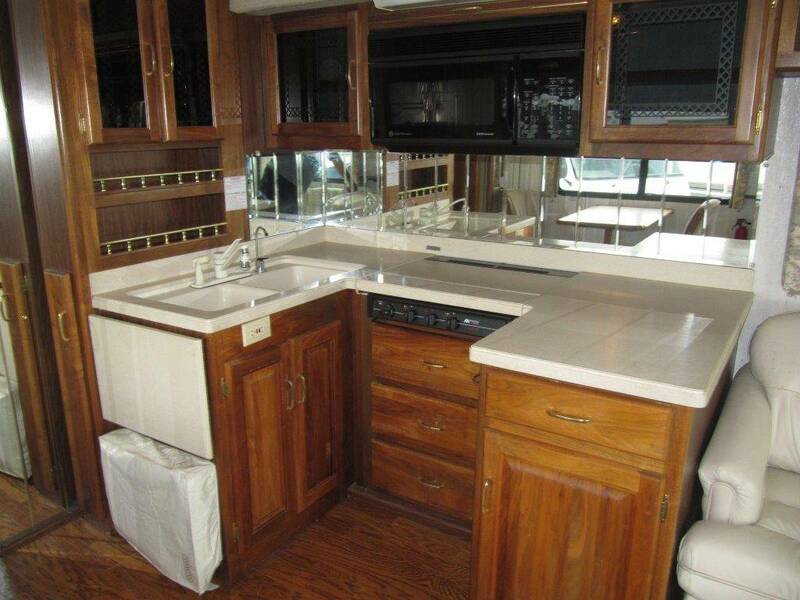 It also has more counter space than many of the others we looked at and in a spot that's good for serving too. The sink isn't pushed into the corner as much as the floor plan shows and there's a counter extension to the left of the sink. The counter top is Corian as is the range cover that lays flat providing more counter space when the stove isn't in use. And finally, we wanted the kitchen on the driver's side so we can have more window space on the passenger side. 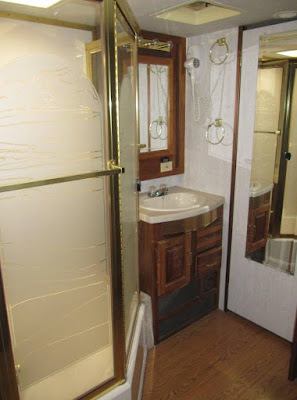 We also wanted a water closet that when in use wouldn't restrict access to the sink, closets or bedroom. While I've already said this, we don't like dinettes. A table and real chairs please. Windows, lots please. Mostly on the passenger side. In the bedroom put them where you can see out while laying in bed (not above the headboard). Lastly we believe that our coach should be as usable with the slides in as with them out. The motor coach we have selected is a diesel pusher, which means that like a commercial bus it has a diesel engine in the rear. 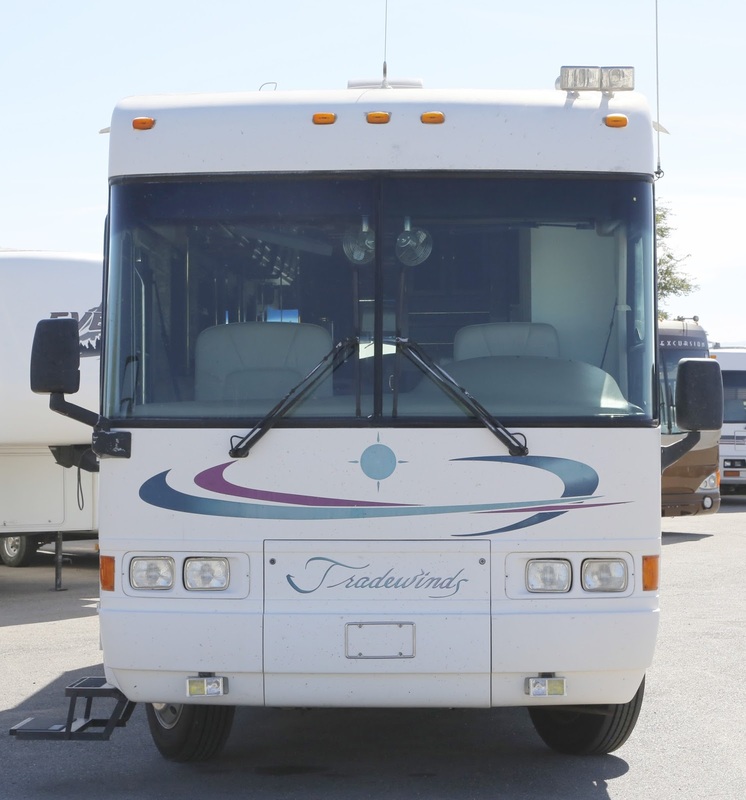 Ours is built on a Freightliner XC Chassis and has a turbo charged Caterpillar engine, six-speed Allison transmission, air suspension, and air brakes. 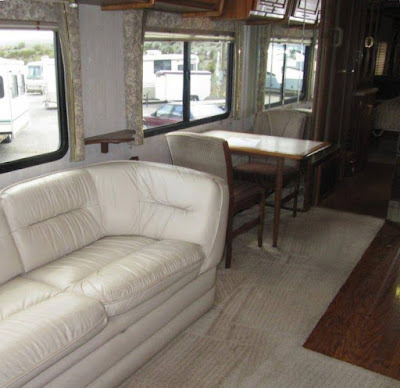 The photograph above shows the front half of our coach with the dining table in the right foreground, kitchen counter and real wood floor to the left, hide-a-bed off-white leather sofa (left), white leather love seat (right) and the leather cockpit chairs in front of that huge windshield. 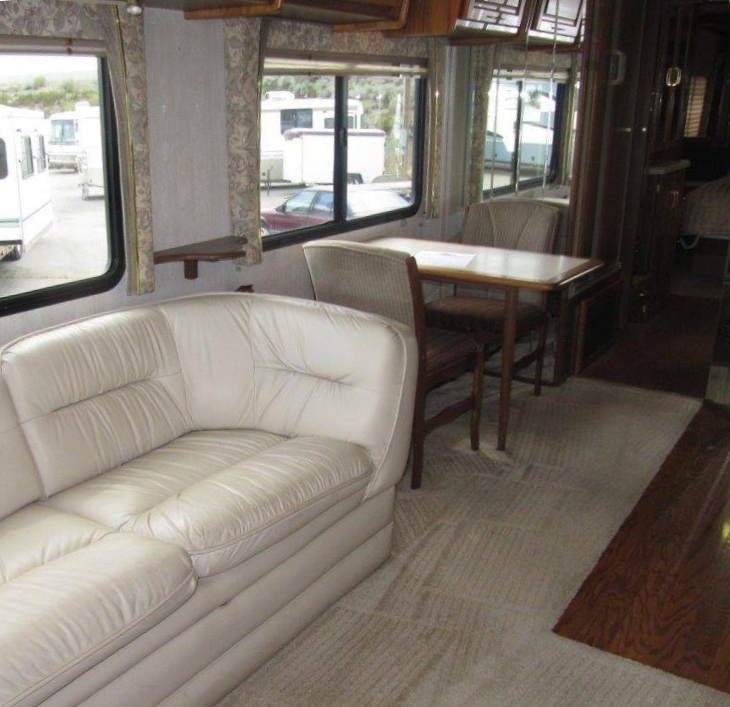 Both of the cockpit seats unlock and swivel around to the living area. The cabinets are solid walnut. Here's a view from the co-pilot seat looking back. These photos are from the seller and aren't the best, but they will do for now. Linda really likes the U-shaped kitchen with lots of counter space. We both like it being on the drivers side so that the large windows are on the passenger side with the door and where the campsites have the tables and fire pit. We also like having a real table and chairs instead of a dinette booth. Beyond the kitchen is a dressing room, shower, water closet, and bedroom. Here's another view of the kitchen. Double sink, Corian counter tops with a drop-leaf extension and range cover, convection microwave oven, and lots of counter space and storage. And here's my flight deck. Hydraulic leveling jacks, push button electronic shift control, air brakes, air horn, heavy duty 6-way electric leather seat, and in-dash rear view camera system. 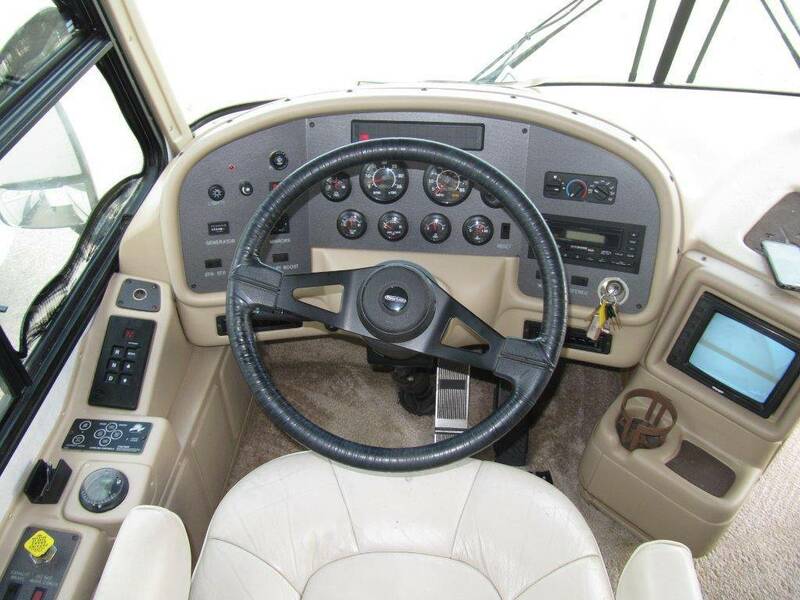 The TRW steering wheel is both tilt and telescoping so you can put it wherever it needs to be. Of course you are sitting forward of the front wheels so there's more swing in your turns (at both ends) and it drives like a bus so the wheel is typically adjusted more horizontal (flat) than you would have in a car. It's a lot like the cab-over fire trucks I drove in Seabrook. I'll take a lot more photographs myself in two weeks when I fly out to inspect the coach. By then they will have completed replacement of the windshield, minor repairs, maintenance, and other work we have requested. If you click on the pictures above they get larger. Yesterday we took a big leap of faith, negotiated purchase terms, and put a deposit down on this Tradewinds model 7372 in Salt Lake City, Utah. Okay, it wasn't as spontaneous as that might sound. This purchase decision follows several weeks of researching and looking at lots and lots of motor homes and comparing features against our list of wants and don't wants. A few weeks ago we settled on this specific make and model. After one false start in Houston we began a dialogue with dealers in California, Oklahoma, and Utah. In the end the best fit and best deal was found in Utah. And here we go!